May has been a whirlwind of activity. Generally, May is quite busy for many; finals, end of school year, graduation, end of school concerts and parties and so on. In my family we have a few birthdays and the most important birthday of all, my baby Laith who turned seven on the 23rd. My brother came up from Houston and all the kids were excited to have him. They love their Uncle. Ali was here only a week and it went by so fast. One minute we were anticipating his arrival and yesterday we were dropping him off at the airport. The days leading up to Ali’s arrival were a bit hectic and so, I didn’t have a plan of attack when he arrived. We kind of just winged it half the time but it was fun. I always like to have at least a dinner plan so I can treat him to some good eats; I didn’t have that either. A bit pathetic really. However, his only request was a sticky toffee pudding which I was more than happy to make. We also had a rhubarb crumble and a three berry cobbler throughout the week. Yes, we only ate dessert :). Whilst, he was here, we did celebrate Laith’s birthday with dinner out and Ali also had the pleasure of watching me decorate 24 Marvel superhero cakelets. Since Laith’s birthday falls at the beginning of summer, there is always some great movie out that we use as a theme. This year, the movie we have waited so patiently for, The Avengers. 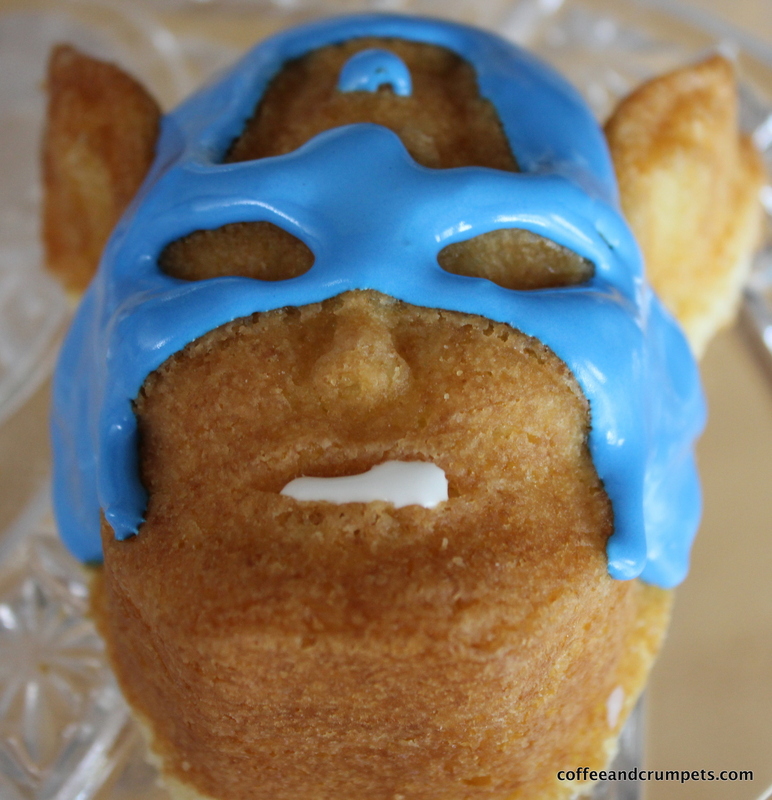 When we decided to do the whole Marvel/Avenger theme, I started thinking of ideas for cakes or cupcakes that Laith could take to school as a treat for his class mates. 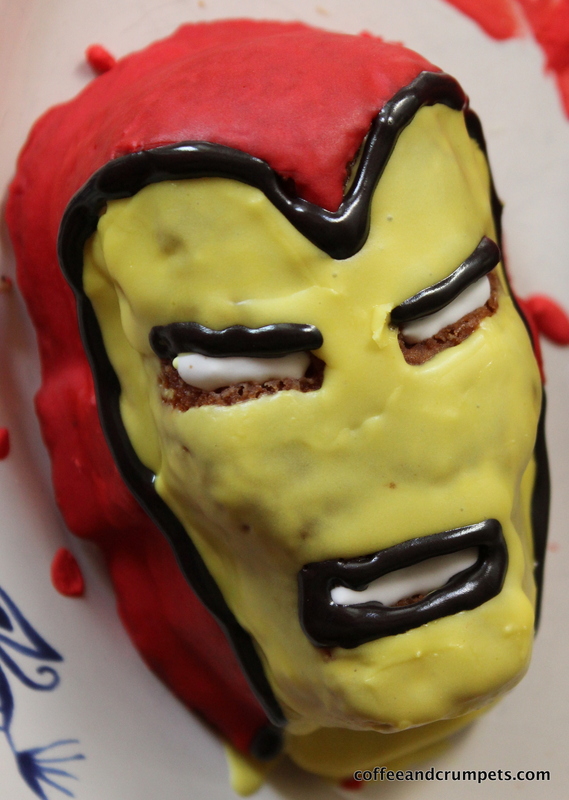 Browsing the internet, I stumbled upon the Marvel Cakelet Pan from Williams and Sonoma. I was thrilled. It’s a cake pan that has moulds of six Marvel superheroes and you add cake batter and voila, you have six Marvel superhero heads, with intricate details, I might add. 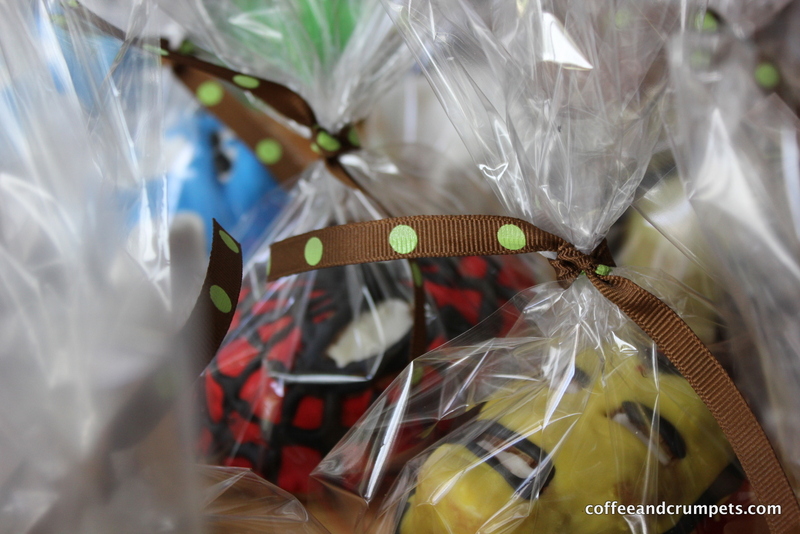 Now, the cakelets are pretty detailed and you can leave them as is, with a sprinkling of powdered sugar, or you can go all out and decorate them with icing. I will tell you now, it’s not easy or quick, but it’s so worth the time and effort to see the end product. Now, here’s the rub, when I went to look for how the cakelets were decorated, I found nothing. The Williams and Sonoma website shows the cakes decorated, but they don’t say how to do it or what to use. It’s a good thing I got the pan weeks ahead and made a batch to try out icings. 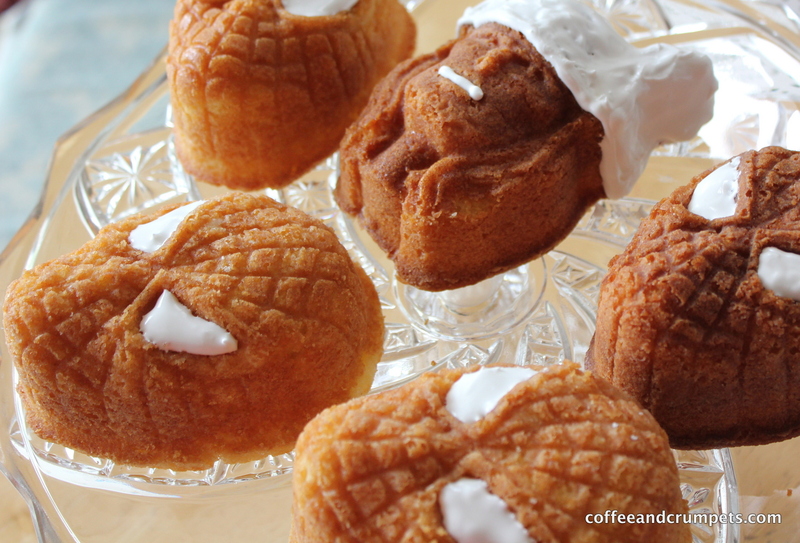 I figured that the best icing would be Royal but I knew also, how detailed those cakelets were and how I would have to play around with the consistency so that the icings would not drip onto each other. 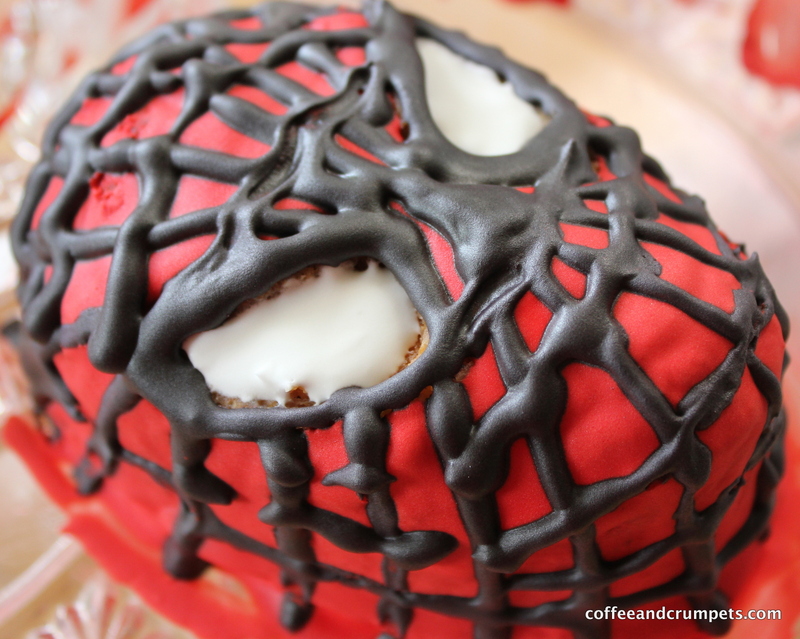 Since there is no tutorial on decorating these Marvel cakelets, I have decided to pen my findings and tips. I hope this helps someone who is as crazy as I am to even attempt decorating these things! I have used Royal Icing in the past but still have no real experience with it. I searched the internet for tips on perfecting Royal Icing and came across a wonderful blogger who is an expert. Her site is filled with the most amazing cookies and Royal Icing work. I used Sugarbelle’s Royal icing recipe so check out her site for the details. I used her recipe for the smaller amount. That was enough for 24 cakelets. Sugarbelle’s site has great tips for consistencies and if you follow her directions, you can’t go wrong. 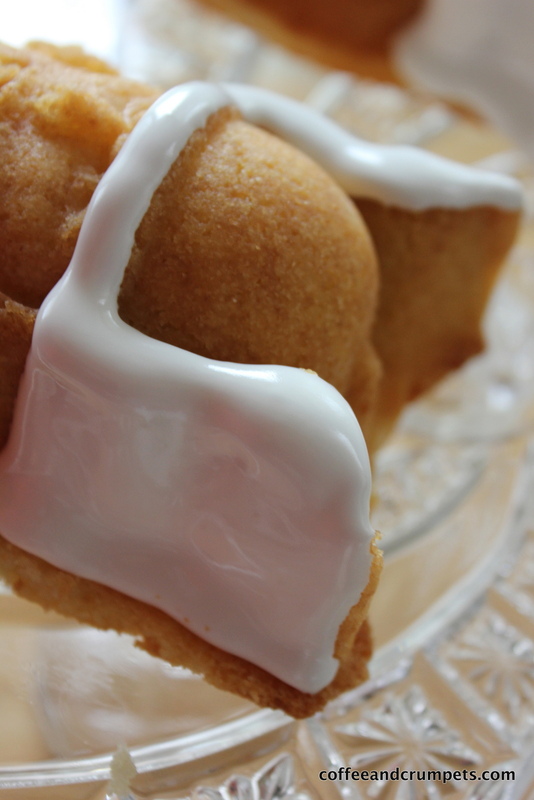 On her site you will find the tips on creating a 20 Second Icing. This is almost the consistency we need for the cakelets. The 20 Second Icing works really well, especially for outlining but is a bit thick and gloppy for filling in all the bits. We need to thin ours out just a tad, to say, a 12-15 seconds to fill in the big details.. You do not want a thin flooding icing because that will not stay on all the angled bits of the cakelets and will just run off. I experimented with the icing and tried to find the right consistencies and you will have to do the same. Atmosphere, humidity and location all play a part in how your icing will behave. 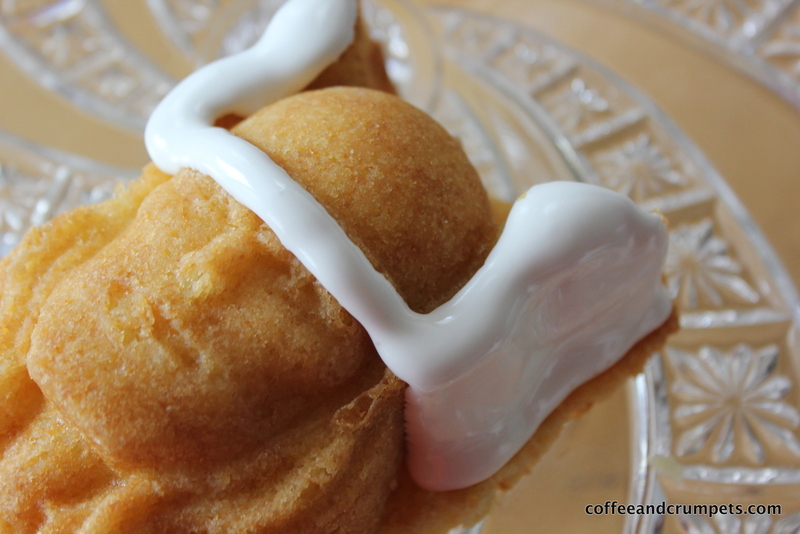 Use the spray bottle tip thats on her site to thin the icing in increments. I used squeeze bottles to decorate everything. I didn’t need too many decorating tips because the work wasn’t too finely detailed. I used the Wilton squeeze bottles and also a Kuhn Rikon squeeze bottle with a decorating tip to get some of the details needed in outlining. Most of the outlining and filling in can be done with a straight up squeeze bottle so don’t worry about getting tips and piping bags etc. Before you start, have all your coloured icings ready to go. It will save time and you can get the cakes done pretty quick. I did 24 cakelets and it took me almost 6-7 hours. However, I didn’t have all my icings ready and so, had to stop and colour and adjust. Colour your icing first and then thin out consistency. Always keep it on the thick side for caution sake. You can always thin out before working with it. I only needed about a cup (or less) of each colour for 24 cakelets. You can adjust accordingly to how many you choose to do. The icings can be stored in the fridge. I used the Wilton colour gels and didn’t really mix and match to get realistic colours. The Wilton colours worked well and the colour was close enough to resemble their costumes and I figured the kids wouldn’t really notice. If I was presenting them to Stan Lee, however, I probably would have spent more time getting the costume colours just right! I will list the colours I used below. As far as the cake recipe goes, I used the recipe that was provided at the back of the box. I figured it was formulated to bring out all the details in the mould so I stuck with it. I don’t know how it will work with a boxed cake mix and if anyone of y’all tries, please feel free to leave a comment. Make the cakelets using the recipe that comes with the pan and cool completely. Make sure the pan is prepared really well before adding the cake batter. I used some Spectrum Organic shortening to coat the inside of each mould and then dusted each one with flour. If you take time to do this step, you will be rewarded with great cakelets with amazing detail. Make sure the cake are cooled before you start decorating. I baked all my cakelets the day before and stored them in air tight containers. Once all your icings are coloured and bottled, you can start decorating your cakelets. I chose to start with the easiest one, Thor. 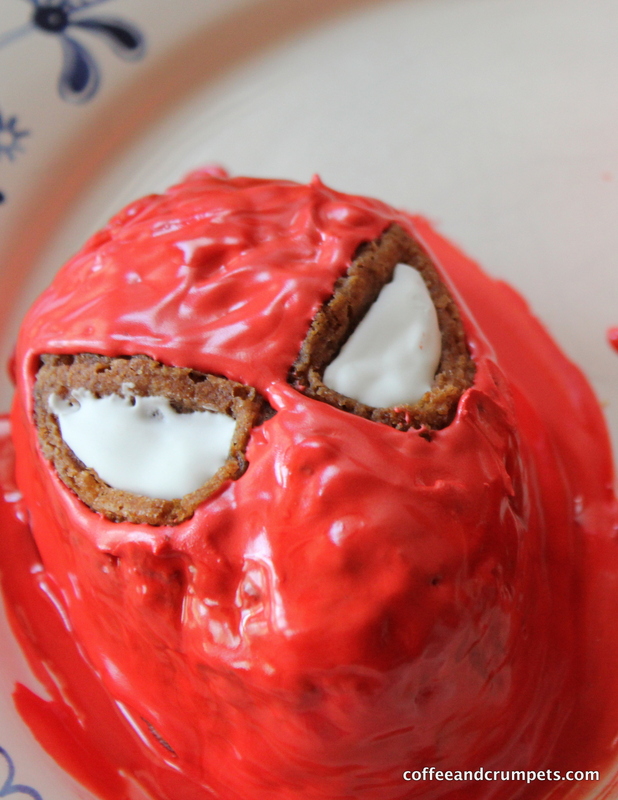 Using the uncoloured icing, I filled in his helmet and some of the other cakelet details, like teeth and eyes on Spidey. Once you complete, a set of the cakelets with one colour, you can allow them to dry while you use a different colour and work on another set. Go back to the other set once the icing is dry and you can work on the other details. I wish I had paid more attention to my order so I could advise you better, but you will see what works for you. I will add though, do the bigger areas first and then add the line details, teeth, eyes etc. Iron Man is tricky because you have two colours on top of one another. Do the gold, top area first and then the red at the bottom. If your lines are bit shaky, you can define with some black, like I did. Also, I coloured the yellow icing light/blond for Thor and for Wolverine and then added more colour to get gold for Iron Man. If you want to use up your yellow icing, you could do double duty and do what I did or just make separate bottles of yellow and gold if you are more comfortable doing that. For Hulk, I did his hair outline first. Then I filled in his face and then his hair. The green accents on the hair came after the black had dried. Spidey looks tricky but he’s not too bad. You are going to fill most of him in red and then after the red dries, you will ice wavy lines all around for his web. Doesn’t have to be perfect because he just comes alive once the web gets on. As you can see, my Spidey isn’t perfect at all. What might help here is a icing tip on the squeeze bottle so your web lines are thinner. You can buy squeeze bottles with tip attachments like the Kuhn Rikon set of squeeze bottles. Captain America and Wolverine are pretty straightforward. With Wolverine, I would work on the black first and then the yellow part. The black icing can get a bit messy and if you drip on the yellow, ugh, it’s a pain! A lot of the accents and definitions are up to you. I chose not to do everything that the picture on the cake pan said to do. It’s up to you how much you want to put in. I think mine looked just fine with the amount I did. 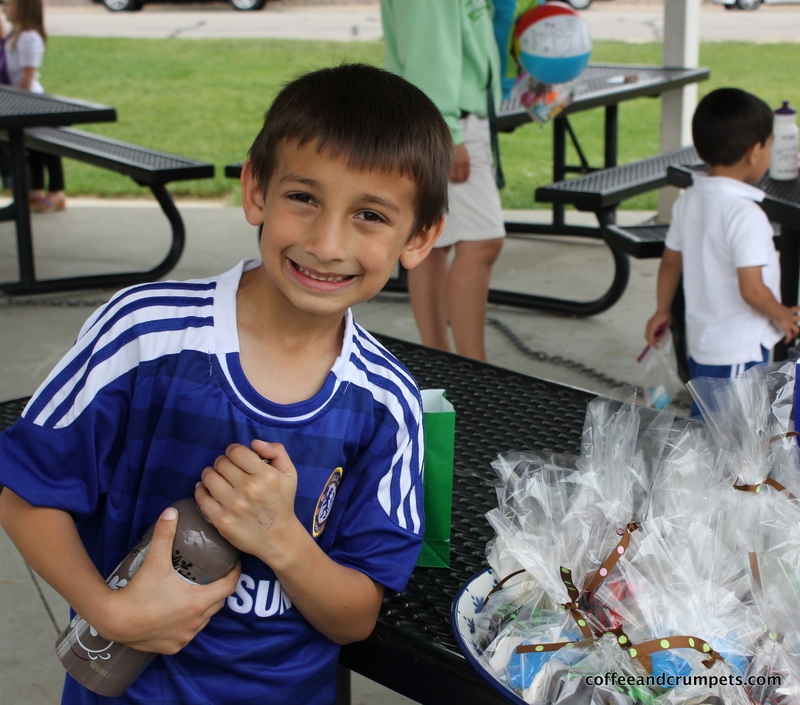 They were all wrapped up in goody bags and tied with a ribbon and handed out to Laith’s friends. 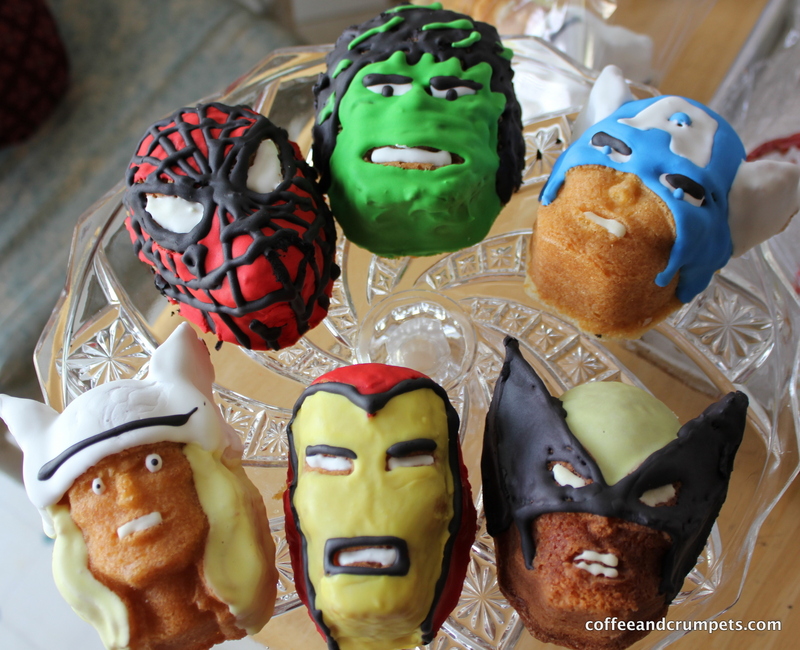 I hope this has helped somebody, somewhere who may want to know how to decorate the Marvel Cakelets. They were hard work but so worth it to see the look on my son’s face and my husband’s who is a big comic book fan. I hope you all have a great Memorial Day and a great week ahead. Thank you for reading! Oh MY Gosh!!!! I’ve been loooooooooooooking everywhere everywhere for a tutorial for this!!! I’m so ecstatic and thrilled that I found your post!! I’m planning to make these in March 2012. I’ve been asking everyone for opinions about these!! Thank Lord for finding you!! How long did it take to dry in order to do the layering? Hi Yaneri, I am so glad my post helped you out! I ran into the exact same thing last year when I was making them for my son. I did a lot of experimenting and finally settled on the royal icing. It doesn’t take very long to dry the layers, by the time you’ve worked on the bits on the other cakes, the first set is done. Some take 5 some take 10, if its a thick layer like the Hulk hair, takes about 15/20 minutes. Hope that helps. If you do decorate them, hope you’ll post them on my FB page! Thank you thank you! It was quite an adventure let me tell you. These silly things took up my mind weeks ahead! I am glad they turned out well. I am hoping to get some interest but I am so bad at advertising myself! Oh well. On to the next project. 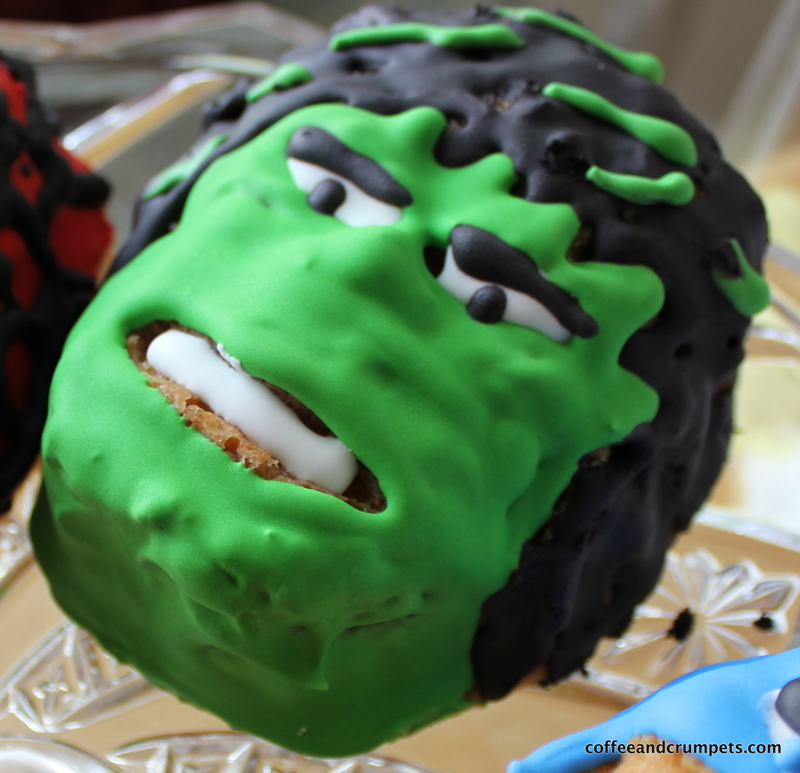 They were delish mind you… well, hulk was. I wasn’t preoccupied…I gave you all my time…except for the day I had to decorate these darn things. You are AWESOME my friend!! !